Called Topaz, it's located in San Luis Obispo County, California. 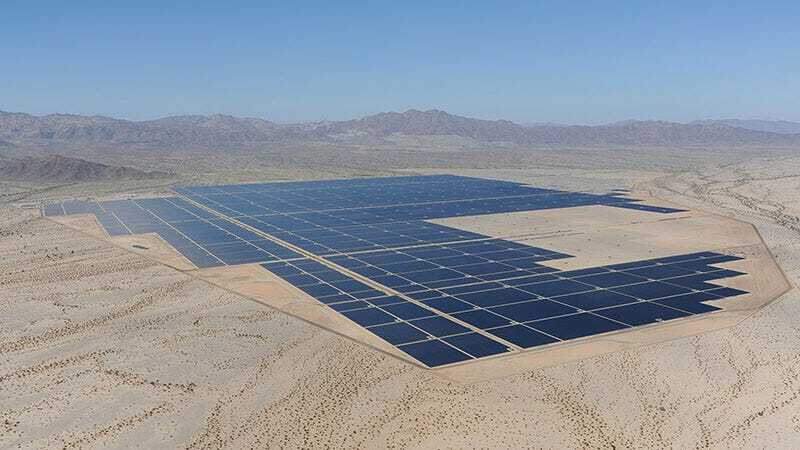 The plant recently completed its final 40-megawatt phase, making it the first 500-plus megawatt solar farm to come online in the United States — and the largest online plant in the world. Topaz, which is manufactured by First Solar, is a $2.5 billion project that consists of 9 million solar panels spread across 9.5 square miles. Construction began two years ago, but it wasn't supposed to be complete until next year. It's a nice, early surprise. The project is expected to generate 550 megawatts, which is enough to power 160,000 homes and displace 377,000 tons of CO2 every year. It was built at least six miles away from some of the more sensitive areas of the Carrizo Plain National Monument and prime agricultural lands. Topaz probably won't hold this title for long. Next year, the massive 579-megawatt Solar Star project should be at full capacity. Images: Center for Land Use Interpretation.